Ruby is an intense Heart crystal, which brings joy, vigour and love of life. 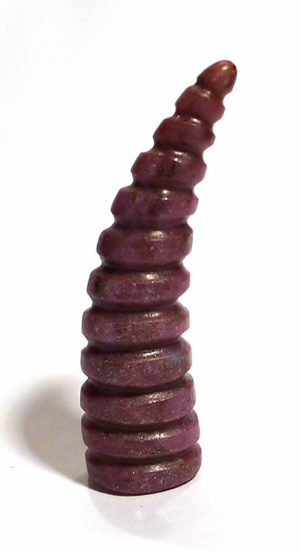 Some crystal therapists associate it with the Root Chakra, and therefore libido as well as grounding and protection, and the denser, magenta-tinted stones align with the Upper Crown Chakra in some colour therapy systems. Combining these qualities, ruby creates a powerful Heart connection with the Divine, while helping us to keep our feet on the ground, and is very good for working from the Heart, on a spiritual level. 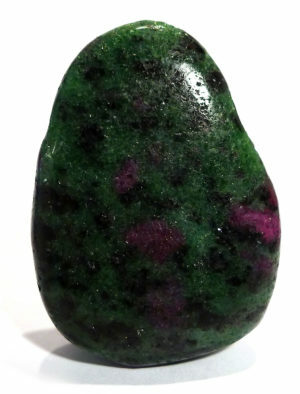 Ruby can support our energy levels when we are run down, but on its own may be a little too powerful in the treatment of ME and Chronic Fatigue Syndrome (CFS), However, potency may vary considerably, and some crystals may be fine for such use. Alternatively, a specimen with a matrix of green zoisite or fuchsite can help to balance this potency, and is also extremely balancing for the immune system, so aiding recovery. Birthstone: Primary birthstone for Leo; secondary birthstone for Capricorn; Up until 1912, onyx, along with turquoise, was the Leo birthstone. The National Association of Jewellers (US) swapped the stones of the star signs Leo and Capricorn, on the basis that the lighter turquoise was more suitable for wearing in winter months, and this has been accepted practice ever since. Ruby and sapphire are the same mineral – corundum – but weren’t recognised as such until the 18th century. Corundum is natural aluminium oxide, and at 9 on the Moh’s Hardness Scale, it is one of the hardest crystals on earth, just slightly less hard than diamond. 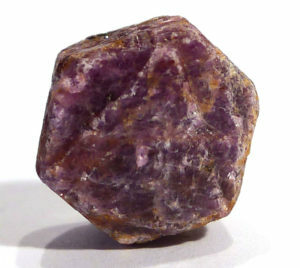 Corundum is most abundant in metamorphic rocks, and in some silica-poor igneous rocks. 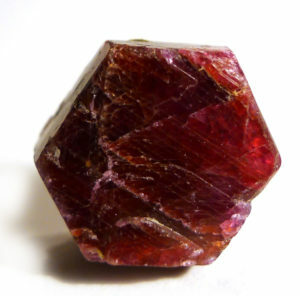 When ruby or sapphire contain rutile crystals that orientate along the growth pattern, cutting en cabochon reveals a six-pointed star pattern or asterism. 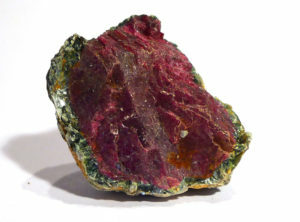 Ruby’s red colouration is due to the presence of chromium, and it may also contain iron oxide, which gives it a slightly brown caste. Rubies tend to occur as relatively small crystals, as the chromium inhibits their growth. The more chromium, the deeper the colour – paler rubies (identified as pink sapphire) contain a lesser amount of chromium.